In a tech-savvy generation, Peoplesoft needed an upgrade. 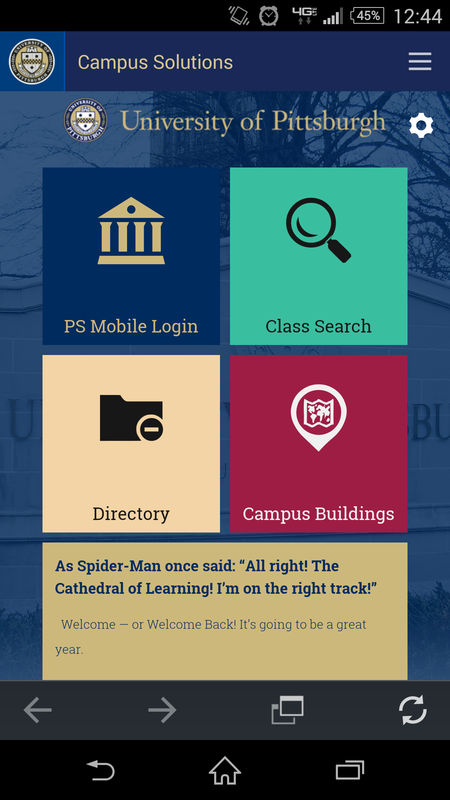 In July, Pitt released a mobile app for PeopleSoft, a previously web-only platform for students to access class information, academic progress and schedule classes. According to spokesman John Fedele, Pitt partnered in early 2015 with HighPoint Mobile to develop the app. Pitt PS Mobile lets students see their class and exam schedules, grades, holds on their account and to-do lists. Students can also use the app to register, add or drop classes. Faculty can view their class roster, teaching schedule and class grades, while advisers can use the app to see their students’ information. Before the app’s release, students could only access PeopleSoft on a computer through a portal on my.pitt.edu. From there, students had to click through a series of options to get to a specific page. Now, students can access the most commonly-used pages through a one-click sidebar on the app. “That’s probably a lot more convenient than going through Self Service and the Student Center,” Jordan Thompson, a junior at Pitt, said. It took approximately six months to complete the project, which is now available for free on both iOS and Android devices. Fedele could not disclose the cost of the project because of contractual agreements. Pitt worked with the Student Technology Focus Group, a group of students organized by Computing Services and Systems Development, to gather student feedback before making the app public. Fedele said students have reacted positively to the new app. Fedele said the app will protect student data through Secure Hypertext Transfer Protocol, a system for securing the connection over a computer network. According to Fedele, the University will continue to evaluate the app and consider adding additional features in the future, including access to Degree Progress Reports.